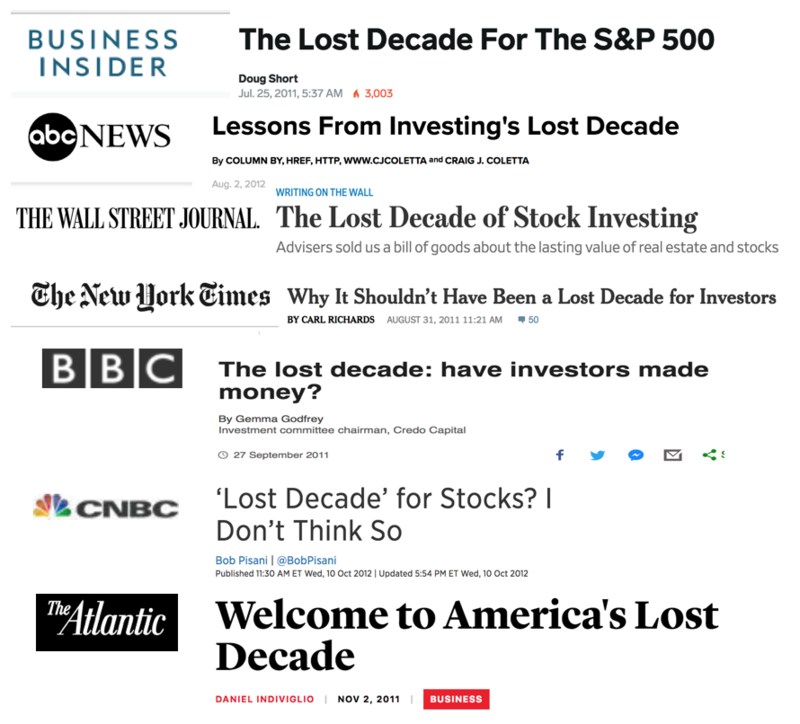 If you were following business news in 2010, you must have come across one or two headlines bemoaning America’s “lost decade”. Between 2009 and 2012, there were many discussions in the business media and many columns were written in the press on this subject. How investors have zero gains to show in their portfolios since stocks peaked in mid-2000? In a period longer than ten years – hence the term lost decade. On the face of it, this lost decade in the stock market is easily verifiable. From its peak in mid-2000, the S&P 500 stock index went downhill in a severe bear market. It recovered briefly in 2007 before going into another downturn. It did not recover to its 2000 peak until the Spring of 2013 – more than a decade later. So it did happen. You can’t fault the media for spreading fake news in this case. 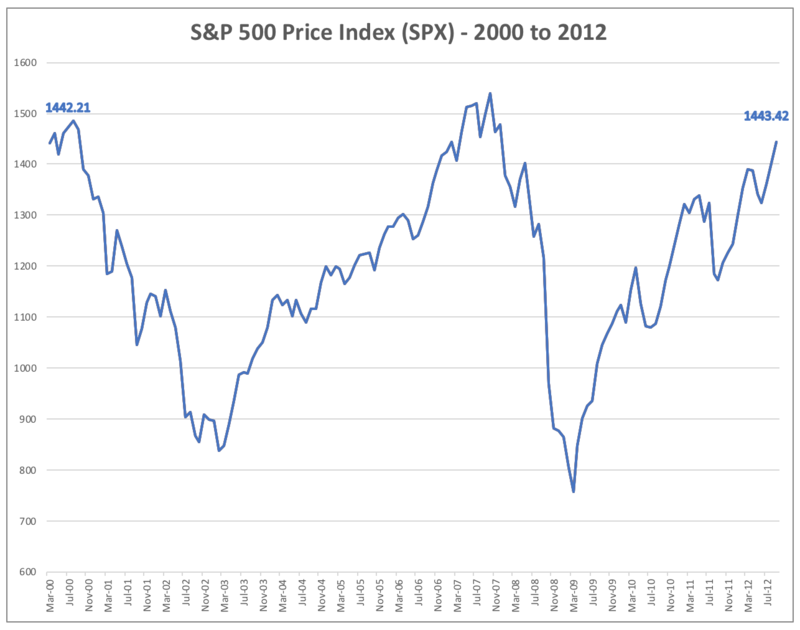 You can see how the S&P 500 did during those years in this chart. However, this is not the complete picture. Most popular stock indices exclude dividends. In Wall Street parlance they show price returns, and not total returns (that include dividends). For instance, the most commonly quoted S&P 500 index that goes by the ticker symbol SPX is a price index. If you want to add dividend returns to it, you’d need to switch to a different index, SPXT. For long-term investors like us, dividends are an important part of total returns. And reinvesting dividends (as opposed to keeping in cash or consuming) is important too. As this previous post explains, reinvesting is key to compounding. Let’s revisit that lost decade – this time with investing dollars. 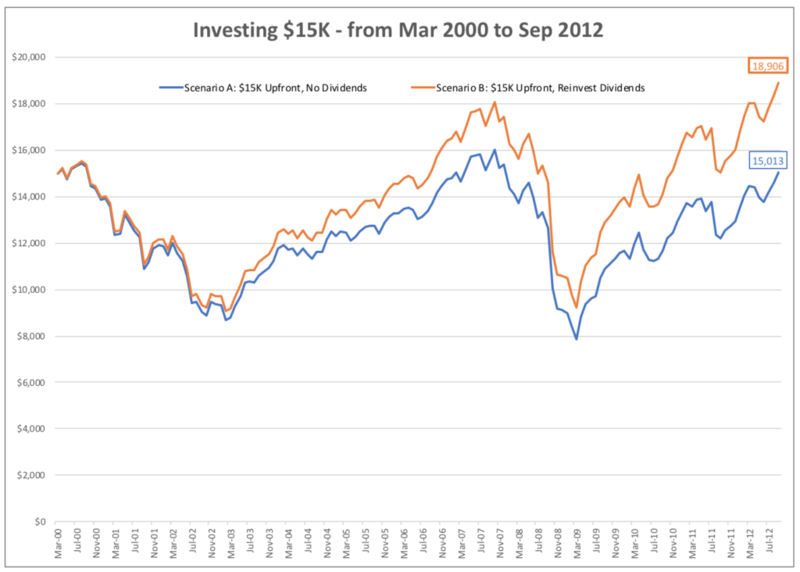 If we invest $15,000 in an S&P 500 Index Fund in March 2000 and ignore dividends, our portfolio will be worth $15,013 by September 2012. Essentially zero gain for a bit more than 12 years of investing. Let’s assume now that we were wise enough to reinvest all our dividends received during those 12 years. In this case, we’d have done much better – our portfolio would have been worth $18,906. A not-so-bad 26% gain in 12 years. Clearly not outstanding result but not a lost decade either! But this is not it. If we are like most other individual investors, we don’t have all our savings sitting in cash at any given time. Instead, we set aside money to invest from our earnings periodically. In other words, we invest as we save. Let’s reconsider the lost decade again. This time assume we don’t have $15,000 available in March 2000. Instead, we just save and invest $100 every month in the same S&P 500 index fund – beginning in that March. By September 2012, we’d have invested the same $15,000 except this time we did it gradually over the entire period – rather than once upfront. 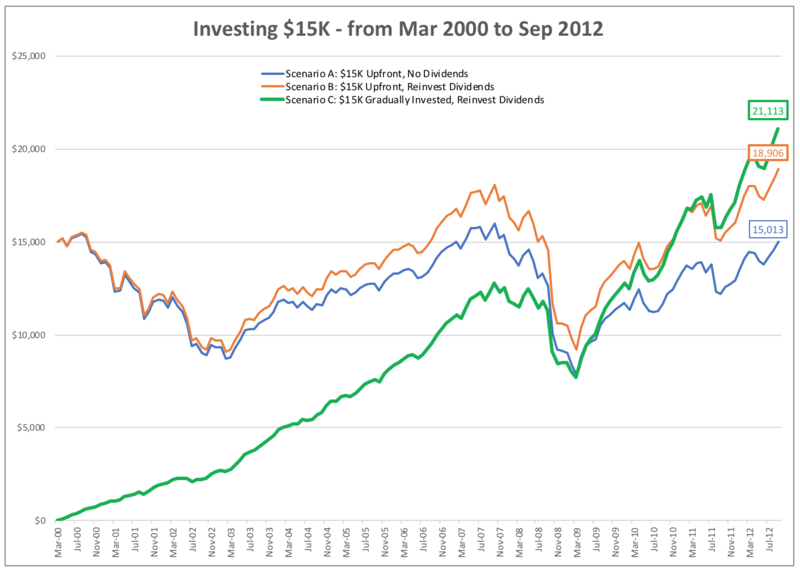 The end result: our portfolio would be worth $21,113 for that period – or nearly 41% total return. Clearly not a lost decade by any measure! Here’s the chart that shows all the three scenarios together. The last scenario (scenario C) we just went through is known as dollar-cost averaging – or what I called in another blog post: Investing in installments. As I pointed out in that post, when we invest a small amount regularly in the stock market, we don’t need to be concerned about where the market is going. So far, all the scenarios we’ve covered were for a hypothetical investor and with the benefit of hindsight. But patient long-term investing works in the real-world too. Below is a real-world investing chart. It shows the results of my own dollar-cost averaging into the stock market over a period of 20 years. When I started investing in 1992, I didn’t know that two bear markets lay ahead. I kept on investing through the next two decades trusting historical long-term returns of U.S. equities. 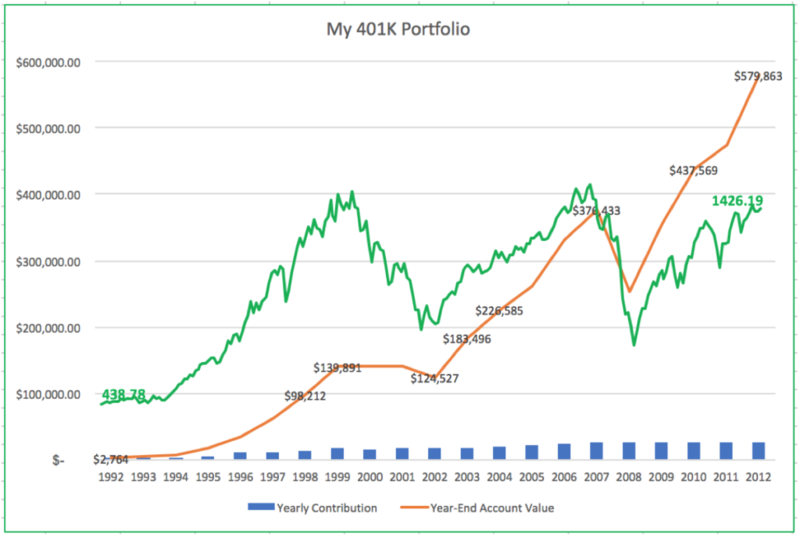 You can read about my 20-year investing journey here: My 401(K) Story. 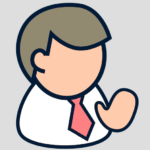 One final note – stock market is known for reversion to its long-term mean return. After a period of less-than-average returns, stocks tend to swing the other way resulting in higher-than-average returns for the ensuing period. The same thing happens in reverse too. It feels like a roller coaster but with one important exception – the long-term direction is clearly upwards. After all, stock investing is not a zero-sum game. If your investing goals are ten or more years out, it’s best if you just keep on investing in equities month in, month out – like I did. And keep reinvesting those dividends and any other distributions (or capital gains) you receive. Ignore what the market is doing – and even more importantly, ignore media laments and prognostications. They don’t have a clue!